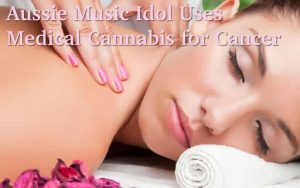 Aussie music idol uses medical cannabis for cancer. After 25 years cancer free, much loved Aussie music idol is hit with cancer again. Olivia Newton-John is again fighting for her life. After her first breast cancer diagnosis in 1992 she advocates medical cannabis for pain and healing. This time the symptoms began after a tennis match. It started with lower back pain she put down to sciatica. It was so bad she had trouble walking. An MRI showed the return of cancer, this time to a bone at the base of her spine. Newton-John said the diagnosis was not a complete shock after the last time. But, it is serious. Newton-John’s first cancer diagnosis was after she found a lump doing self-examination. Olivia said that back then cancer was a death sentence that few people talked about. Terribly, she had a partial mastectomy and chemotherapy for a year before going into remission. She said there has been a lot more research into cancer these days so it is not as frightening as 25 years ago. She said surviving cancer changed the way she looked at life. Her music changed and she raises money for the Olivia Newton-John Cancer Wellness and Research Centre in Melbourne. This time round she is better equipped to deal with the cancer. She has done it before, and will do it again. Newton-John said part of the healing is making the decision to work through things. Newton-John has metastatic cancer, which is the same type of cancer as last time. While this is serious, she aims to fight to either beat or manage it. She said she has so far responded well to treatment and was pain free. The pain had been terrible and she was limping. She has been working on getting her mobility back. The pain has now gone with treatment and she has her mobility. All current results show she is on top of the disease. A mix of conventional medicine and herbal remedies. Newton-John said her life will be one where she manages the disease to live with it. Although she is working of get rid of it. Along with photon radiation therapy, she uses natural remedies. Newton-John said one of the most important natural remedies is cannabis. Cannabis is legal in California, Newton-John’s home, and her daughter (Chloe Lattanzi) has a cannabis farm in Oregon. Newton-John is an advocate for medical cannabis in Australia saying it plays an important role in relieving pain and healing. She said getting permission and the medical cannabis is a long, complicated process in Australia. Even though it is legal. And, the process is different in every state. She intends to do everything in her power to promote medical cannabis treatment and easier access for patients in Australia. Aussie music idol uses medical cannabis for cancer. Nothing keeps her down. Newton-John was recently back in Australia. She sang with old friends John Farnham and Daryl Braithwaite to raise money for her wellness centre in Melbourne.